Despite the fact that he’s been campaigning for over a year, it can still be hard to reconcile the reality of Donald Trump’s GOP-backed presidential bid with the notion that humanity is not just one huge garbage fire. After all, it’s not like Trump’s running with just his own money, fueled by just his own bigotry; nor is he alone in pursuing pet projects like the birther movement he recently tried to disavow. We say “tried,” because that hour-long informercial he gave last Friday just left us wondering what kind of hotel he’d built, and whether it could be scaled by one of the Supernatural bros. It was hard to make heads or tails of that dog-and-pony show, but late night’s Samantha Bee was on the case. The Full Frontal host parsed through Trump’s statement to find that, despite being under 40 words, it was still riddled with factual errors. 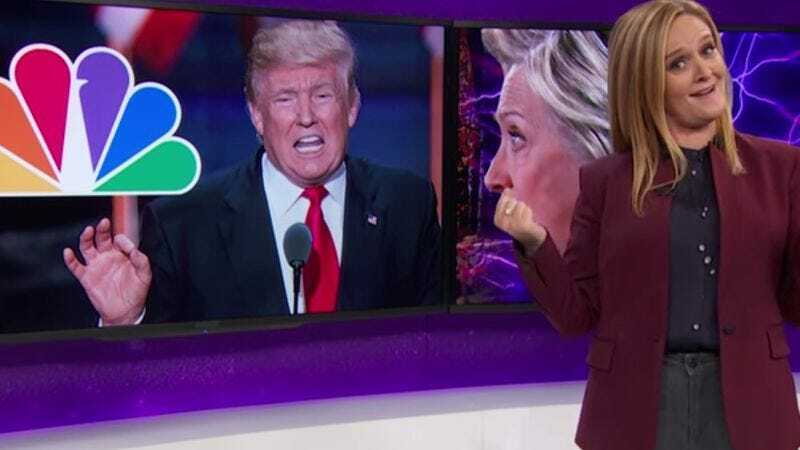 And, just as she once followed the breadcrumbs back to the GOP’s rejection of Trump, so too did Bee trace the roots of NBC’s tacit support back to Trump’s Apprentice days. Sure, NBC put some distance between them when it removed Trump as the Apprentice host, but it then winked at him by inviting him onto some of its most popular shows. NBC’s not alone in looking the other way when it’s convenient, though—after all, various cable-news outlets scoffed in irritation after Trump’s press conference, but waited with bated breath as his private plane taxied about.